Even the ice cream trucks are melting. It's been hovering around 95 degrees here in Chicago, so it's definitely ice cream time. Awesome sculpture from the streets of Adelaide, South Australia. 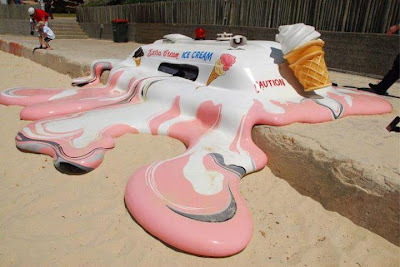 "Hot with the Chance of Late Storm" was created in 2006 by the art collective Glue Society.